Double soups are all the rage these days, but Harumichi takes it a step further. I teamed up with a few of the Bassanova staff to check it out. Triple soup. Going even further, its a pork x chicken x gyokai soup by day, and a pork x chicken x niboshi soup at night. It was still technically lunch, as we arrived just before 3:30pm. It looks like the noodles are cooked in the gyokai broth. A nice touch. This was a great bowl. Tonkotsu gyokai at it's best. I judge this type of ramen by the subtleties. Harumichi had a nice creamy undertone. Even the egg was top notch. It's becoming difficult to pick a favorite shop in Shinjuku. At the annual Mitaka Wish Tree, can you spot my wish? Its pretty simple, and I'd wager that it has a chance of success about as close to 100% as you could get. 2010 was an amazing year for ramen. Thank you to everyone who read this site, met up for noodles in Tokyo, gave me suggestions, and included me in their own ramen adventures. There's been bit of a trend in ramen recently. Hip bistros that serve drinks and snacks at night have been making ramen during the day. This is a great idea, though the inevitable return trip for a night of wine and yakitori tends to be a bit of a shock on the wallet. Zoot fits the bill, with comfortable seats, mood lighting, and fine wine. But you came here for the ramen, no? As with most trendy shops these days, its simple and good. The soup is full of fat bits and umami. I'd like to come back some evening, the wine is enticing. I spilled a beer on my keyboard, rendering it useless. This meant that the next days adventure would be into the heart of Akihabara, the electronic district of the city. I set the bar low for this shop, even though Matsukaze is in every ramen magazine and book, usually near the front. Akihabara isn't known for it's good food. Maid cafes, 7-story robot stores, and Ferraris decorated with anime decals - yes. Great noodles - no. Then I had a taste. This is an excellent bowl. Unexpected. The shop blends a typical fish and pork broth with a vegetable puree. The result is a thick, rich, and maybe even healthy bowl of ramen. Like I said, a big surprise. The location is down a nondescript alley along a street reserved for discount computer supplies. And if you are in the same boat as me, you'll be happy to know that there is a store about a minute away from Matsukaze selling nothing but keyboards. Nagi Nicai is a very relaxing place in the evenings. Almost like an izakaya. But for lunch, it's a busy tsukemen shop. All they have on the menu is tsukemen. You can choose regular noodles, or the shops homemade momen. Feeling adventurous, both Daniel and I went with the unknown. A nice touch is the bowl of pickled ginger to cleanse your palette. I had the meat version, with an excellent piece of grilled chicken. The momen noodles are wide and long. It's like eating lasagna noodles. A unique bowl indeed. The taste was good, but a bit hard to eat. If I came back for lunch I'd get the regular noodles. I walk by this shop every Friday on the way to one of my lessons. But every week I am full of food from the lesson previous, where after teaching English to my student, I eat Thai food with her and her grandkids. Not a complaint, but the free meal puts a damper on any ramen adventures. A change in the schedule this week left me with room for a bowl, so I checked it out. Tasukiya serves up thick noodles and a thick, fishy broth. There was a lot of fish flakes floating in the soup. I didn't drink the soup, as it was a little heavy. It passed, but to be honest, you should really come to Tsukishima for the monja. Or Tsukishima Rock. Winter sees a lot more days off, and I decided to join a kojomoe adventure with some friends. Kojomoe (工場萌え) translates as "factory love". The idea is to go to industrial complexes and take photos. There's a lot of books, sites, and clubs who do this sort of thing on a regular basis. Anyways, my new giant-underground-water storage-flood prevention room fan friends and I were in the mood for ramen. Every 7-11 in the country has a copy of the local Ramen Walker magazine, which we used to make our choice. Being out in the far reaches of Saitama, our options were limited. And most places in Saitama seem to be closed from around 3pm to 6pm. Heikuro was the closest ramen shop that wasn't closed. Four styles, I went with the spicy tonkotsu. It was good. Standard, with a spice level that was fine for me, but trouble on one of my friends. By the way, from 4pm until 6pm on weekdays, you can get unlimited kaedama (替玉). So basically this is an all-you-can-eat ramen shop. The high school kids who came in at the same time took full advantage of this. One of them was up to 800g of refills by the time I left. Sorry for the completely un-ramen related post. That's me in the Santa suit, my motorcycle covered with toys. Every year, my motorcycle club organizes a charity event. We collect toys, load up our bikes with said toys, and ride from Tokyo to orphanages in the surrounding area. 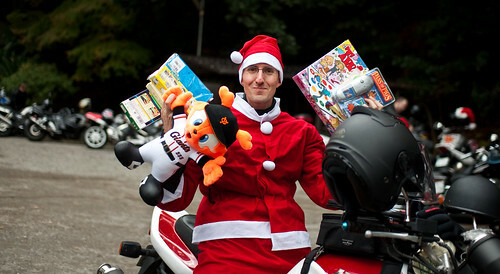 The idea of a "Toy Run" is very common around the world. But for some reason, it never happened in Japan. We set about to change that, and after a very successful 2009 event, we plan on an even better 2010. If you would like to make a donation to our event, please click the paypal link below. This year's event is on December 12th. Donations after that day will go to the next years run. Anything will help, even just a couple bucks. I'll try to eat some ramen after the event, down on the seaside of Kanagawa. And I'll make one more non-ramen related post, with some pictures from the event. For now check out the event site here. My adventure of the day was to Koiwa, a little station about 20 minutes east of more central Tokyo. When I reached into my bag to get my atlas, with it's cataloged recommendations, I suddenly realized that it was at home. Probably still open to the Koiwa page. Lucky for me, the 7-11 has the new Ramen Walker in stock, and a plan B was no problem. Bari Bali was a good find. The relaxed atmosphere is offset by the complexity of the ticket machine. What to order? A Thai inspired green curry ramen? With a level 5 spiciness? The choice wasn't hard. Much like Bassanova, it starts with a green curry paste, then adds the main soup. The soup is very different though. More of a vegetable soup than anything else. Very refreshing. I'd give it 2 stars of spice though. The chef greeted me in English, and it turns out that Johnny, as he is called, spent much of his youth in Los Angeles. Fond memories of ramen in his childhood, he set off to recreate what he loved. No, the Thai ramen wasn't a memory of his past. It was simple shio that he wanted to succeed at. Could I eat another bowl? You bet! It's different than your average shio. Bari Bari nice! Apparently the taste changes throughout the day, and a lunchtime bowl will be a lot weaker in taste. Besides some great noodles, this place is very relaxed. Johnny takes liberties with the choice of music, and a big screen TV on the wall was blasting American hip hop. When you go, tell him I sent you! I've had some interesting ramen adventures in these past couple years. The latest started with an email from a producer at Nihon TV's morning show, Zoom In!! Super. It's a daily, nationwide news program with random segments thrown in the mix. The Maru Q bit takes a topic, asks questions to strangers on the street, and consults with an expert. Yesterday, the Maru Q piece was about how dirty your curtains get, and how to clean them. This Thursday, December 2nd, the subject matter is foreigners and their love of ramen. They wanted me to be the expert in their show. Jumping at the opportunity, I recommended about 10 shops that I often take foreign visitors to. We ended up filming at 3 of those. Nagi, Bassanova, and Fuunji. We filmed a lot of stuff. Introducing the shop to the news reporter, eating, commenting, talking about the web site. A surprise, Nagi had on hand some of their new spice mix that was made for their Hong Kong shop, Butao. I mentioned before that I am really loving this taberayu boom that is happening now. Well this was the best so far. A mix of hot oil, numbing sancho spices, shrimp meat (I think), and peanuts. We all had a taste, and though it might have been too spicy for some of the crew, Imanaka-san and I loved it. Keizo and I got interviewed side by side. I really hope it makes the final cut. It's been great to share so many things with my good friend. On camera, Japanese people eating food is a cliche. Take a bite, ponder for a second, then give a deep, emotional response. Follow it up with an insightful comment. I tried my best! Another cliche of Japanese food shows is the closeup shot of the bowl, steam rising, spoon gently swirling the soup. And the noodles slowly being lifted. I have never seen a food program where this was not the case. There's a better shot over at goramen. The next shop was Fuunji. I think it's the best tsukemen in Tokyo, though sometimes I miss the hot stone over at TETSU. Same deal. Intro the shop, eat in front of the camera, make comments. A piece of advice. Some people say not to wear white after Labor Day, but I say don't wear white to a ramen shop. I used Japanese and English. I'm curious how they will edit it. The show will air sometime between 7:00am and 8:00am on Thursday, December 2nd here in Japan on Nihon Terebi, which is channel 4 here in Tokyo. I'll try to get my hands on a copy. This sort of thing usually makes it onto youtube.